Who has time to be sick with so much sewing to complete? This fabulous natural remedy will keep you healthy so you can get back to your sewing projects. Last year when the flu was taking over Austin I made a flu tonic that kept my family from getting the flu. It really worked, but it didn’t taste so great. While the flu raged, I did some research and discovered that Elderberry Syrup can prevent colds and the flu naturally. Since discovering a variety of Elderberry Syrup Recipes, I’ve been perfecting the process and we’ve been taking it regularly. Prior to discovering Elderberry Syrup, I had never heard about this amazing little berry. So, exactly what is an elderberry? It is a blue-purple fruit found on a wild shrub that is native to the United States. Recently, I planted an elderberry bush because they grow naturally in Texas and are a part of the honeysuckle family. I can’t wait to use my own elderberries someday soon and will add a photo once the bush starts producing. Why is Elderberry Syrup so effective? 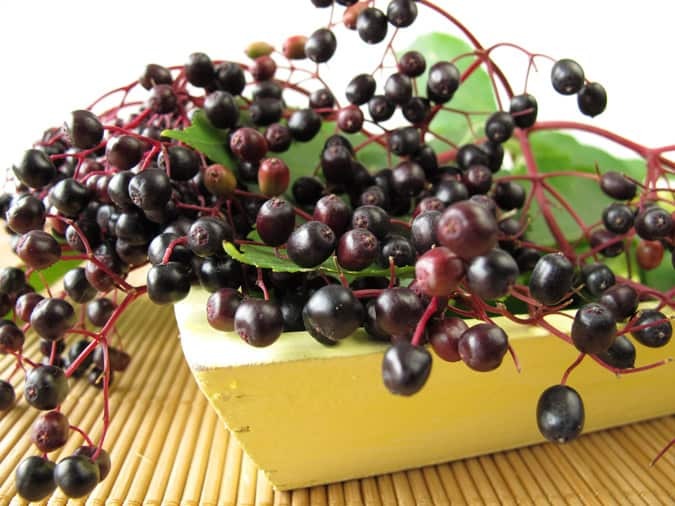 Elderberries can reduce inflammation and give a boost to the immune system. Because it’s natural, Elderberry Syrup does not have any side effects ~ unlike Tamiflu which can have some severe side effects. You can purchase Elderberry Syrup on Amazon or at a local health food store. It’s pretty pricey for something you may want to take daily during cold and flu season. Which is why I make my own (you knew this already) and I am going to share this simple recipe with you. First, you are going to need some elderberries. I purchase these organic freeze-dried elderberries on Amazon. (affiliate) This 1 lb. bag and will last a long time if stored in the freezer. The other ingredient that you will want to get is raw unfiltered honey. If you have a local source for raw unfiltered honey, that would be best. **NOTE: If you plan to give this to children under 1 year of age, DO NOT use honey as a sweetener, try coconut sugar instead. Turn down the heat and simmer on the stove for 30 minutes. Strain off and discard the elderberries and spices. Allow to cool before blending in honey. If you add the honey to the hot mixture too soon it will destroy the honey's beneficial enzymes. Once cool, add honey and stir until well blended. Add all of the ingredients EXCEPT the honey to the Instant Pot Pressure Cooker. Secure and lock the IP lid in place. Set to Manual for 20 minutes. When done cooking, allow to naturally depressurize. Allow to cool before blending in honey. If you add to the hot mixture too soon it will destroy the beneficial enzymes in the honey. Once cooled, add honey and stir until well blended. How much Elderberry Syrup should you take? I take 1 T. daily during cold and flu season. If I feel something coming on, I will take another couple of doses during the day. Most people recommend taking smaller doses more often if you are exposed to the flu. It is so safe that it is impossible to overdose on Elderberry Syrup. Of course, use caution and check with your doctor if you plan to give this to a child. When exposure to colds and viruses means we are likely to get sick, we blend the Flu Tonic with our Elderberry Syrup. Think of it as a daily flu shot ~ without the unpleasant side effects. Thank you for this information about the Elderberry and the info on where to buy it. Now if I can find a source of unfiltere honey. Thanks for this recipe -looks great! I planted an elderberry tree this spring; it is still very small, but I am looking forward to harvesting my own berries someday! Oooh! I’m so jealous! Good luck with your tree! I must try this. I love using natural remedies! I need to whip some up and send it to my husband (who lives in Austin). P.S. I am moving to Austin soon! Welcome to Austin (and Texas)! The best place on earth! This is great! I love natural health products like this, and even better to make them at home! Pinning this…definitely going to need it this winter! Frontier brand elderberries are available on Amazon in organic or no organic. Ooo, I can’t wait to try this. I love a good syrup on my pankcakes and my waffles. 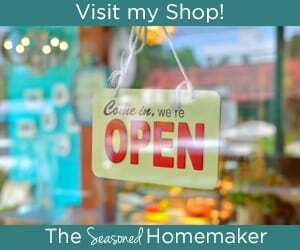 Thank you so much for sharing and for linking up to Thrifty Thursday. Hi, Leslie. 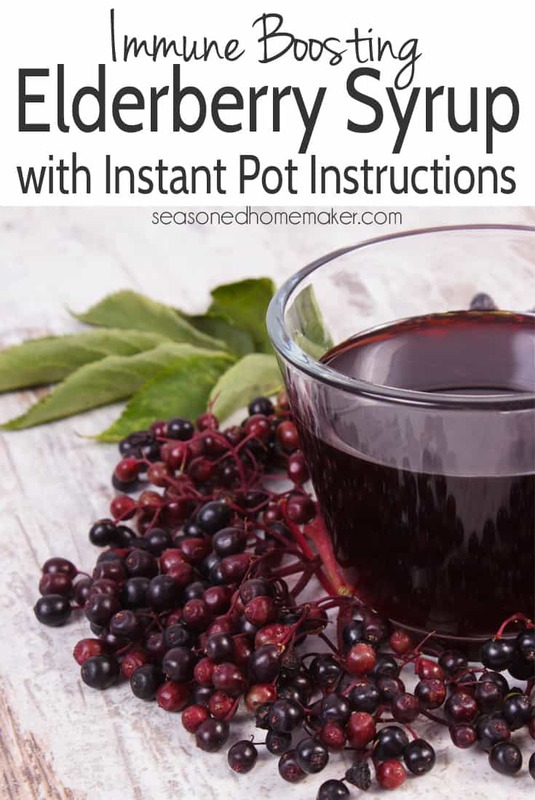 I just found you on “From The Farm Blog Hop.” I have been willing to pay the high price for elderberry syrup because it is natural, and I believe it has kept my family healthy through flu season. We have elderberries growing in the woods around us and I would love to make my own. Next season I am going to give this a try. Would you know how I could adapt the recipe for using fresh elderberries? I’m not absolutely sure, but from what I can tell, use 1 C. of fresh elderberries and reduce the water to 2 cups. Thanks for stopping by at the Wine’d Down Wednesday and sharing your link! I am pinning this onto our new WDW Pinterest board. Hope to see you back again next week! This is so helpful – thank you for sharing. I didn’t know you could just buy freeze-dried elderberries – I’m thrilled! I have a bag of fresh elderberries in the freezer that I am planning to use for syrup this winter when I will hopefully have time to prepare them. 😉 Right now I am crazy busy with soap for the Christmas season. Hi there! 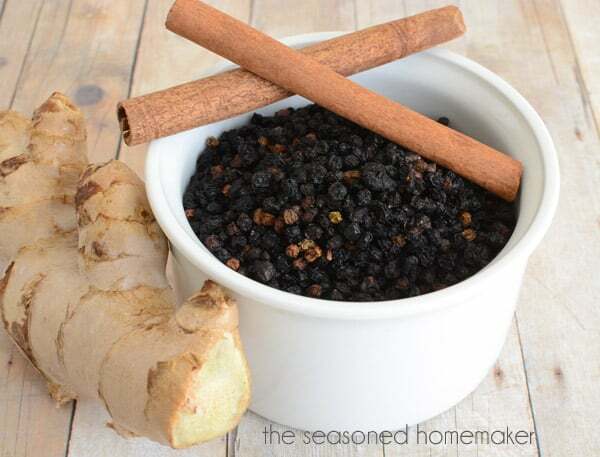 Wanted to let you know that I really enjoyed your recipe for Elderberry Syrup and have chosen it as one of my favorites from last week’s Saturday Spotlight blog hop. It’s been featured on this week’s blog hop which started at 9pm EST on Friday, and was PINed to my Pinterest page. Thanks so much for linking up! Looking forward to seeing what you have to share next time. Thanks for the recipe, so much better that having to take medicine, which doesn’t help. My mother made jelly out of elderberries, when we were little. Sure do miss her jelly, it was great. Thanks again! Hi. This looks great and I’d love to try it. I don’t have an instant pot. Whatever that is. Are there modified instructions for cooking this in a standard t? Thanks! The instructions include both methods. The first recipe is for the stovetop. The second recipe is for the Instant Pot Pressure Cooker. My elderberries arrived and I’m finally ready to try this recipe. How much is a “small” piece of ginger? About 1-2″ of a medium-sized piece of ginger. Just shared this on my FB author page. Thanks for sharing the Instant Pot version. I’m all about saving time by using that gem! Hi Leslie, I have a bottle of Simply Organic ground ginger, could I use that in place of the fresh ginger? Yep. I do this all the time if I’m out of fresh ginger. Just go easy – start with 1/2 teaspoon and see if you like the taste. Thanks for the Instant Pot Recipe. Just a heads up that Elderberries do have a “side-effect”. They activate cytokines as their mechanism of action which is not a bad thing neccessarily. But when taken to much or too often can create a cytokine “storm” which can cause a systemic inflammatory response. So, I recommend taking at the first sign of illness or exposure to illness. Or some people will take for 5 days on then take the weekends off. Never take close to vaccine exposure as vaccines also cause cytokine storms. No, I use spring water. I’m planning on making this today! Do you have any tips on if it’s possible to can the syrup to store in the cabinet until I open it? I’m worried about damaging the honey enzymes if I try to can it. I recommend keeping it refrigerated. I would love to make this syrup, but I am allergic to honey and fructose so I cannot use any type of sugar. Would this syrup still be beneficial without the honey/sugar? How much does this recipe yield? If refrigerated, how long will the syrup last? It depends. If you make it on the stove you will lose some to evaporation. If you make it in the Instant Pot, you get back almost all of the liquid you add. If refrigerated, how long will the syrup last? It’s good for a month. Making this again today! My boys seem to be coming down with something so I think I need more on hand. Tried something different this time and added a tsp of turmeric and a dash of Cheyenne pepper. Fingers crossed it turns out just as good as usual! Hmmm. I like the way you think. I may try this on my next batch.